Welcome to my third FREE weekly BullCharts TipSheet. I hope you find the few tips in this edition useful. Please feel free to send me feedback, or requests for additional topics. Over the Christmas period I will take a break for a week or two, so there won't be a weekly tip sheet next week (Christmas period), and maybe not the week after (New Year period), but I will probably be writing again in the week after that. In the mean time, may you and your family and friends have a safe and happy Christmas and New Year. Which global indices are available? How to view these indices? How to view these indices - EASILY? This topic comes up from time to time in our monthly Melbourne BullCharts User Group meetings, so I thought I should publish some notes about it for future reference. It is possible to view a number of overseas stocks, indices, etc. in BullCharts on a Daily chart (or weekly, monthly - but not intraday). See details below. At the BullCharts web site, on the home page, there is a section called "Announcements"
Short list of global indices and codes. One way to view these indices in BullCharts is to type the index code into the "Symbol" field in the BullCharts "Security" toolbar (see screen shot here). A sample code is US.^DJA (Dow Jones), and hit the Enter key. 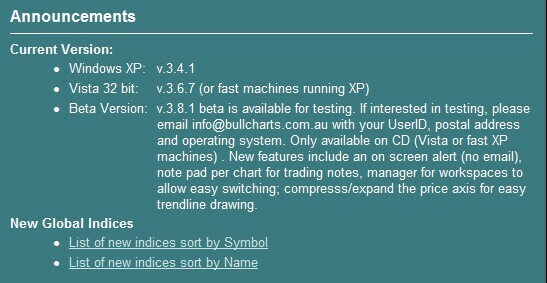 Note: one current downside - BullCharts does not display the name of the displayed index, only the code. So you need to be familiar with your favourite codes. If you have a few indices that you like to view from time to time, or perhaps add indicators to, etc., then there is an easy way to readily view the charts - enter the desired codes into a BullCharts Watchlist (like the one in the screen shot here). 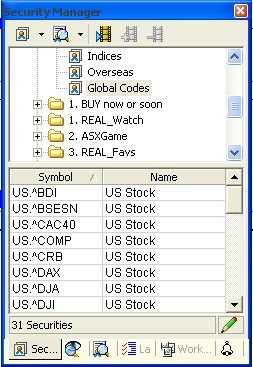 You can either type the codes into your own Watchlist, or it is much easier to cut and paste a list of your preferred codes. I have stored a list of more common ones in a text file with a link here. To use this link, you can right-click on it and either "Save Target As" and save it to your hard drive, or "Open in New Window". In BullCharts, create a new watchlist (and name it Global Codes, for example), and right-click on the watchlist name, then select "Properties" from the drop down menu (or double-click on the watchlist name). This will open the Watchlist Properties dialogue box. Open the text file of index codes in NotePad (or whatever other program you might be using). "Select" all entries in the NotePad window (you can use the menu options, or Ctrl+A), and "copy" these to the Clipboard (you can use the menu again, or Ctrl+C). In BullCharts, in the Watchlist Properties dialogue box, you can "paste" the Clip Board entries (right-click inside the Properties dialogue box, and choose Paste, or just use Ctrl+V). You can watch a video tutorial of the above steps by downloading the tutorial file from the Yahoo Forum link below (it is best to right click and "Open in new window", and you will need to log in to the Yahoo Forum - if you don't have access, please email to me - no problem). Here are three useful Function Keys. When you have a basic price chart, and you "Insert" several indicators as separate panes (not over the top of the price pane; but in their own pane), then each pane gets compressed vertically and they all get a bit difficult to read. Especially if your PC monitor is not very tall. (Note: these new panes are added either above the price pane, or below, depending on the setting in Tools > Preferences > Indicators - see screen shot above). The F3 key will toggle on and off the "stacking" of these indicator panes. When the panes are stacked, there is one pane visible and the others are available by clicking on the tabs across the bottom of the chart. If you have a price chart, or an indicator pane, that is a little cramped vertically, mouse click once in the pane (to make it the active pane) and hit the F7 function key to "maximise" that pane to full window size. When done, hit F7 to revert back to the normal view. 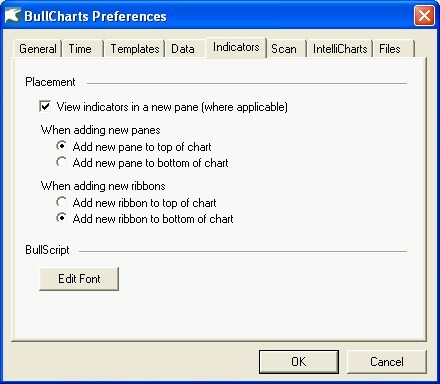 In earlier versions of BullCharts, the F8 key was used to display the Scan or Security Manager window pane. In BullCharts version 3.8 we now have six different tabs available in this window pane and we are calling it the "Control Panel". The quick way to display this Control Panel, or hide it, is to use the F8 Function key. If you want, you can undock it from the side of the screen, and have it "float" within the window.